There is a crafty genius about the works of George Bernard Shaw, but it takes acting of a high order to truly bring out the full flavour of the feast. The good news coming from Oldham Coliseum last Friday night (May 13th) was that the performance was compelling, relentlessly funny and joyfully irreverent. It might very easily not have been so, for John Branwell, who was due to play Alfred Doolittle, was taken ill on the afternoon of the play. Stand-in James Quinn had just three hours’ notice and was compelled to read from a script, yet he did so with such aplomb that nothing of his character was lost. Crucially, the key roles of Henry Higgins (James Simmons) and Eliza Doolittle (Charlotte Brimble) were performed with a richness and verve that artfully drew out every dimension of their characters' complexities and idiosyncrasies. Christopher Wilkinson provided the perfect counterbalance with his depiction of the genteel Colonel Pickering, a pastel shade to the vivid colours of Higgins and Doolittle. In doing so, they emphasised the delightful irony that after six months, Eliza had shown herself entirely capable of being a lady, while her tutor was deeply lacking in the manners and graces his social station was supposed to have endowed him with. This commentary on the excesses of the class system from a century ago inevitably lacks the impact of a contemporary satire on today's society, but it is potent nonetheless, and given full force by the fine stage performances. Backed by excellent sets and a superb use of lighting - the twilight of the penultimate scene was artistic gold cast in sapphire blue - the show was a masterpiece, doing full justice to a tale that has stood the test of time. 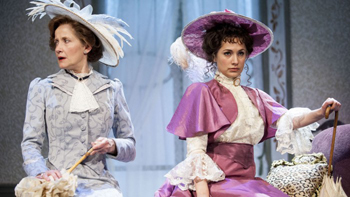 I went along to see ‘Pygmalion’ assuming that it would be effectively ‘My Fair Lady’ without the songs and I was very pleasantly surprised. Much as I love the Lerner and Lowe musical, which actually came out in 1956, long before the famous 1964 film version (and just six years after the death of George Bernard Shaw), ‘Pygmalion’ is in many ways a more sophisticated piece in which the nuances of the class system are examined in more details and the interpersonal relationships are given much more depth and credibility. The ending (which I will spoil) is certainly much more thought provoking than that of the musical adaptation. My only criticism of the piece, which is very much personal opinion, is that either there were more characters than there needed to be or one or two of the minor ones could have given a bit more life. That is a minor point though regarding a show which never slacks in pace and kept me hooked in from start to finish. ‘Pymgalion’ is an old work that clearly deserves to brought out for re-runs and one thing which I find quite remarkable about George Bernard Shaw is that his language has a freshness and vitality that makes it so much less dated than so many other works of his times. I remember seeing his 1894 play ‘Arms and the Man’ (about a Balkan war in the 1880’s) and assumed that the script had been updated until I learned that it was the original work. The same can be said of ‘Pygmalion.’ However, a great play still needs to done properly and full credit must be given to Oldham Coliseum for putting on a great production. Sometimes, a great show comes to the stage against the odds, and in this case Chris Honer stepped in to direct after the original had to pull out for personal reasons, only for the actor playing Alfred Doolittle to fall ill on the day of the performance, with James Quinn finding out he was taking the part at 3.30pm! I can only say that I was scarcely aware that he performed script in hand because his command of the character was so complete, and funny whilst the rest of cast were superb with some really compelling exchanges, particularly between Henry Higgins (James Simmons) and Eliza Doolittle (Charlotte Brimble). Credit must be given to the staging which brilliantly transformed from street scene to elegant London house, with a sleek efficiency that required next to no suspension of disbelief by the audience. All in all, a really enjoyable night out, and if you think ‘Pygmalion’ is just the mono version of ‘My Fair Lady’, think again; it’s a compelling work with a lot to say about today, just as it did back in 1912.